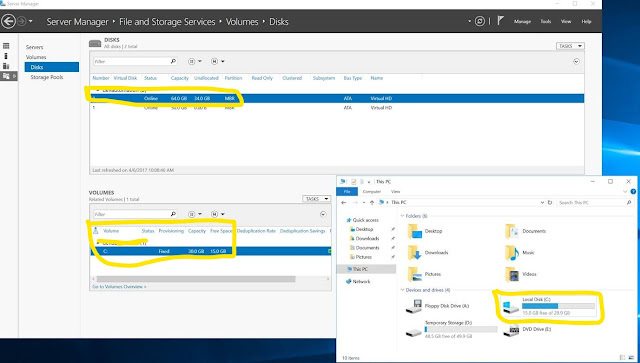 In a very recent change over in Azure-land, the program team decided to change the default OS size from 128gb to 30 gb. As per the information in this bulletin this change was rolled out in conjunction with managed disk. It also currently states that Azure is in the process of rolling back these changes. I first noticed this issue when browsing the Azure advisors boards and someone had posted a question on it. At the time, I was unsure if this issue presented itself even if you specified the "DiskSizeInGB" parameter in either ARM templates or in powershell. Luckily for me, I had configured a machine just the day before that exhibited the issue. In the ARM template for the machine, I clearly specified 64gb as the disk size. Here is a screenshot of what was provisioned in the VM. As you can see from the image, I do get provisioned an OS disk of 64 gb, however the partition by default only uses 30gb of it, leaving 34gb as un-allocated space. I think it would have been okay if simply the default had changed (say if you created a VM in the portal), however, the fact that it is also ignoring the diskSizeGB setting is disturbing. As the link suggested, this change is being rolled back.